Proprietary Name: Triamcinolone Acetonide What is the Proprietary Name? Non-Proprietary Name: Triamcinolone Acetonide What is the Non-Proprietary Name? Triamcinolone Acetonide with NDC 70518-1926 is a a human prescription drug product labeled by Remedyrepack Inc.. The generic name of Triamcinolone Acetonide is triamcinolone acetonide. The product's dosage form is cream and is administered via topical form. FDA Application Number: ANDA040039 What is the FDA Application Number? 6 and molecular weight 434.50. CAS 76-25-5. Triamcinolone Acetonide Cream USP, 0.1% contains 1 mg Triamcinolone Acetonide per gram in a base consisting of cetyl alcohol, cetyl esters wax, glyceryl monostearate, isopropyl palmitate, polysorbate-60, polysorbate-80, propylene glycol and purified water. Topical corticosteroids share anti-inflammatory, antipruritic and vasoconstrictive actions.The mechanism of anti-inflammatory activity of topical corticosteroids is unclear. Various laboratory methods, including vasoconstrictor assays, are used to compare and predict potencies and/or clinical efficacies of the topical corticosteroids. There is some evidence to suggest that a recognizable correlation exists between vasoconstrictor potency and therapeutic efficacy in man. Topical corticosteroids is indicated for the relief of the inflammatory and pruritic manifestations of corticosteroid-responsive dermatoses. Topical corticosteroids are contraindicated in those patients with a history of hypersensitivity to any of the components in the preparation. If irritation develops, topical corticosteroids should be discontinued and appropriate therapy instituted.In the presence of dermatological infections, the use of an appropriate antifungal or antibacterial agent should be instituted. If a favorable response does not occur promptly, the corticosteroid should be discontinued until the infection has been adequately controlled. Patients using topical corticosteroids should receive the following information and instructions:This medication is to be used as directed by the physician. It is for external use only. Avoid contact with the eyes.Patients should be advised not to use this medication for any disorder other than for which it was prescribed.The treated skin area should not be bandaged or otherwise covered or wrapped as to be occlusive unless directed by the physician.Patients should report any signs of local adverse reactions especially under occlusive dressings.Parents of pediatric patients should be advised not to use tight-fitting diapers or plastic pants on a child being treated in the diaper area, as these garments may constitute occlusive dressings. The following tests may be helpful in evaluating the HPA axis suppression: Urinary free cortisol test; ACTH stimulation test. Long-term animal studies have not been performed to evaluate the carcinogenic potential or the effect on fertility of topical corticosteroids.Studies to determine mutagenicity with prednisolone and hydrocortisone have revealed negative results. Corticosteroids are generally teratogenic in laboratory animals when administered systemically at relatively low dosage levels. 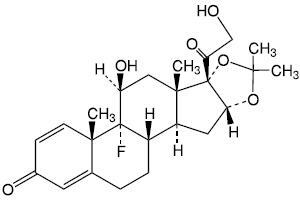 The more potent corticosteroids have been shown to be teratogenic after dermal application in laboratory animals. There are no adequate and well-controlled studies in pregnant women on teratogenic effects from topically applied corticosteroids. Therefore, topical corticosteroids should be used during pregnancy only if the potential benefit justifies the potential risk to the fetus. Drugs of this class should not be used extensively on pregnant patients, in large amounts, or for prolonged periods of time. not likely to have a deleterious effect on the infant. Nevertheless, caution should be exercised when topical corticosteroids are administered to a nursing woman. Pediatric patients may demonstrate greater susceptibility to topical corticosteroid-induced HPA axis suppression and Cushing's syndrome than mature patients because of a larger skin surface area to body weight ratio.Hypothalamic-pituitary-adrenal (HPA) axis suppression, Cushing's syndrome, and intracranial hypertension have been reported in pediatric patients receiving topical corticosteroids. Manifestations of adrenal suppression in pediatric patients include linear growth retardation, delayed weight gain, low plasma cortisol levels, and absence of response to ACTH stimulation. Manifestations of intracranial hypertension include bulging fontanelles, headaches, and bilateral papilledema.Administration of topical corticosteroids to pediatric patients should be limited to the least amount compatible with an effective therapeutic regimen. Chronic corticosteroid therapy may interfere with the growth and development of pediatric patients. The following local adverse reactions are reported infrequently with topical corticosteroids, but may occur more frequently with the use of occlusive dressings reactions are listed in an approximate decreasing order of occurrence: burning, itching, irritation, dryness, folliculitis, hypertrichosis, acneiform eruptions, hypopigmentation, perioral dermatitis, allergic contact dermatitis, maceration of the skin, secondary infection, skin atrophy, striae, and miliaria. 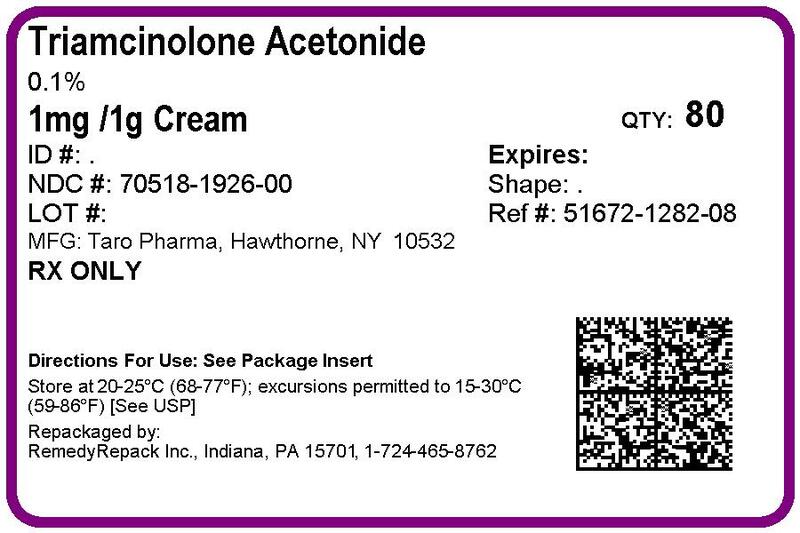 Triamcinolone Acetonide Cream USP, 0.1% two or three times daily depending on the severity of the condition. Occlusive dressings may be used for the management of psoriasis or recalcitrant conditions. If an infection develops, the use of occlusive dressings should be discontinued and appropriate antimicrobial therapy instituted. Triamcinolone Acetonide Cream USP, 0.1% in 15 g (NDC 51672-1282-1), 30 g (NDC 51672-1282-2) and 80 g (NDC 51672-1282-8) tubes. Store at controlled room temperature 20° to 25°C (68° to 77°F). Avoid freezing.